KOI AND GOLDFISH SPAWNING IN BACKYARD POND IS EASY TO RECOGNIZE. A lot of times the spawning season in our backyard koi ponds is brought to our attention because of the conditions mentioned above. Most pond owners are pretty tuned into the changes in conditions and “seasons” that every year brings us and our ponds. One of those “seasons” in our ponds, is spawning season; which typically occurs during May through June. Of course, a bit earlier or a bit later, a bit longer or a bit shorter of a spawning season depending upon where you live. And the “rules” of spawning get broken all the time when sudden condition changes occur that may trigger our fish into spawning mode out of season. If you are not familiar with what to look for, so you can witness a koi spawning, there are some easy to recognize signs any pond owner can see. 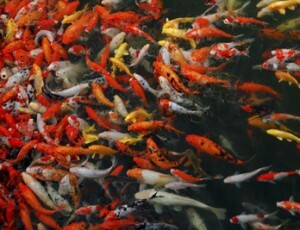 We all know that our koi and goldfish get along very nicely, without aggression or competitiveness toward each other. This type of behavior makes up the vast majority of behavior we expect to see with our fish. Then one day spawning season hits and our fish are at each others throats, or at least chasing each others tails. The pond is full of fast, aggressive and frantic activity. The fish are chasing each other around and around, jumping clear out of the water at times, and jamming themselves into skimmer boxes, there is frantic group activity along the shoreline rockwork and plantings. We also have pretty consistent water quality conditions with nice clear water, and a clean pond surface just about all year. Then spawning season comes to town and we see that our water quality is different. It has gotten very murky, it seems to have a slick surface quality, and the surface of the pond is also very foamy and getting foamier. The skimmer box is packed with foam, and gives out a very fishy smell when you open it. What the what!!! Our pond’s conditions change quickly, drastically, and it isn’t all that pretty but don’t panic. Its nature and the will to survive. Don’t try to “treat” the water to get your normal day to day conditions right back in your pond. 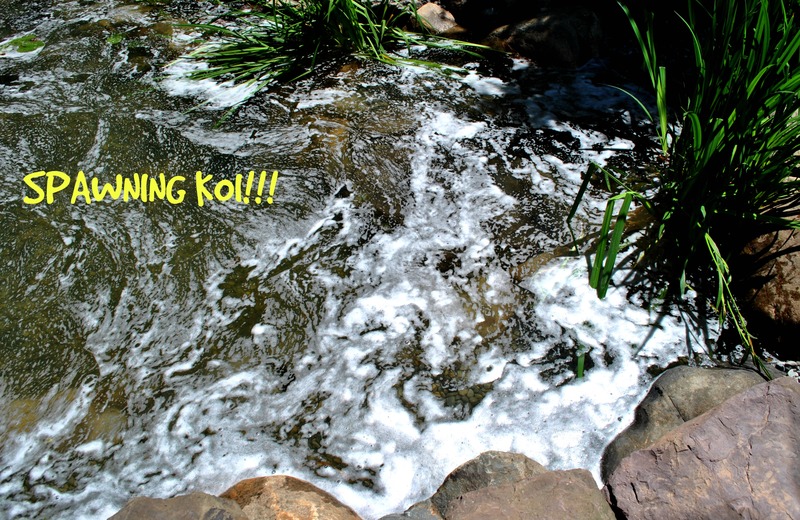 Step away from the de-foaming agent you are about to dump in your pond! Put down the test kit. Try to let your pond go through the entire spawning without interference. Let your filters take care of the water quality, let them do their jobs, it may not happen overnight; but they’ll do it. Your water quality will rebound to normal daily conditions, of course assuming you have proper filtration. The rotten fish behavior we witnessed with all that aggression and chasing will soon return back to its normal day to day slow dance of color within your peaceful pond. But koi are koi, and they are going to spawn how they see fit, and there is nothing we can do to change it, even though all the males gang up and beat up the females pretty badly. The aggressive behavior is definitely stressful, sometimes deadly, to the females and you will see they get pretty beat up with torn fins and all, sometimes bloody. However, they too will typically recuperate with a little time, and also return to normal day to day activity in the pond. The female koi may not talk to the male koi for a while, but time heals all. The smelly water, you know that pondy smelling water; well that will dissipate as well and your pond will go back to (hopefully) it’s odor free state of being. If any smell lingers then carbon will due the trick to remove foul odors. Some fun stuff to do during the spawn is to get some photos (yes, I realize how that sounds) or video (I know how that sounds too). When the koi and goldfish calm down, go try to see some of their eggs. Koi and goldfish eggs should be visible around the shoreline rocks and plants. The eggs will be clear, round, and the size of a grain of salt, maybe a tad larger. Try to hatch some eggs indoors in a small tank of pond water and gentle aeration; you’ll be surprised how easy it is! After the “koi and goldfish courtship” is over, take a good look at your fish to see what condition they are in. Take measures if necessary. Make sure that they are being properly aerated, especially in very foamy conditions. A good pond aerator is always good to have on hand! After they have calmed down give a good rinse to filter pads they will be pretty nasty. Just a few weeks you will likely start seeing darting little koi and goldfish fry around the edges of your pond; swimming in and out of the rockwork and plants where they will grow out until they are real deal baby fish. A short few months later, colorful little koi will be milling in with the bigger koi trying to get in on some of those delicious pellets being served up; and it will make you happy. So, that is why the pond professional told the customer “congratulations” when the customer thought that their pond had gone completely off the deep end! My goldfish had babies…….are they supposed to be black? Hi Mike, thanks a million for your informative site and for all the answers to your readers’ questions. I have a pond that we made last winter. In the spring I added 11 goldfish and 13 mosquito fish. (I live in a hot part of the south of France and mosquitoes can be a real pain.) The pond is a huge success with thousands of bees and other insects visiting very day, along with some birds. 9 months on and I now have hundreds of tiny mosquito fish and my goldfish have produced at least 25 babies. I noticed today that they appear to be spawning again. Could this be because the temperature has just dropped from 38 degrees C to about 28 degrees? I’ve just taken off the shading net too. What has sparked a new spawn at this time of year? Hi Mike! I have a koi pond with 3 new koi (I purchased in May) and 7 existing fish (may be koi, goldfish, comet….I’m not sure how to identify them). None of the existing have the ‘whiskers’ but 2 resemble koi. The other 5 look more like goldfish (maybe, I honestly have no idea). There are 30-40 baby fry swimming around my pond now. They hatched around july 4. They are all still brown. Is this common? Is there any way to tell what I have? I know its not a lot of info, but I am a rookie to this…..I was shocked to see all the babies!!!! The last two times my Koi spawned, some of my fish died. The first time I lost 5. This time I lost 2. What is causing this. I had perfect conditions in the pond before the spawn. In both cases the female was one of the victims. What can I do to prevent this in the future? Thank you for the very helpful site! We have a goldfish pond and were away for most of the spring. The pond is badly in need of cleaning, but the fish were happy enough to spawn anyway. How long after the spawn should we wait before vacuuming? We have 6 golfish of varying age and size. We added 3 to our four a couple months ago but one diied within a few days. There was a lot of activity and everyone was getting along pretty well and then they all seemed to disappear, but I would catch a glimpse occasionally of the larger two hiding under a large rock outcropping. Now I have seen a very small baby goldfish on the rdge of the rock a couple of times. Is this hiding behavior simply protecting the babies? Thanks ib advance for your help. Hey, I have a small pond in my backyard with 5 goldfish. I went to feed them the other day and could not see them anywhere. My wife and I thought someone stolen them or a predator ate them. Two days later I found them all hiding under the filter. They now hide there day and night where before they were very active in the pond. I thought maybe they laid eggs under the filter or could there be a predator visiting our pond at night? Any suggestions? Omg…the koi are going crazy. I yelled at my husband to go out and check on them. It seemed like they were attacking two of our thirteen fish. It was awful to watch the two swim around trying to get away. Okay now it makes sense. I guess I’ll have to put up with the loud noise and bubbly look. How many days does this go on for? Thank you so much for the quick response! I listened to the podcast and it was wonderful and full of such great information! I’m going to try to do just as she said with this batch of mops but still need to learn how to keep ammonia down for the future spawns when i keep the mops in the pond. We did a tiny water change yesterday and the ammonia again at night registered .50 . Went out again this am and the surface was covered again with foam that smelled too high heaven lol and tested 1.0. While it’s not lowered , it’s not the whopping 5.0 it started out at the initial spa spawn. Thank you so much for your wealth of knowledge and sharing it with us! Wish me luck! Made 7 spawn mops for the pond and we now have eggs! Unfortunately my ammonia spiked and was a whopping 2.0! Used ammolock and salt to prevent further damage to our koi and waited for our filter to weed out the ammonia. It would lower at night to. 50 then back up to 2.0 during the day. For fear of losing our koi we removed the mops with the eggs and transferred them to a 20 gallon tote and small filter. It seems to have worked and our ammonia level is down to .50 and still dissipating. I prefer your method of just letting naturer run its course, however not at the expense of mykoi. What can i do in the future Mike, without removing the breeding mops and allowing them to stay in the pond in regards to ammonia levels???? Hello Denise. If you are trying to raise them then I would suggest doing exactly that!! And then listen to this excellent podcast of mine on raising the eggs! Click the link. We have a garden pond approx 7 x 4 x 4feet deep. We have gold fish about 20 various sizes about 3 years ago we noticed about 13 small black fish, who now are turning golden and maturing well.. Question one large goldfish appro 9 inches long and very fat, looks in distress and exhausted, we have found what look like eggs (fry) very small white peas with a black piece of rice inside, is the fish dieing? Should I separate the spawns into a smaller tank within the pond ? We have a mixture of 1 Koi, shebunkins, comets, calicos, bullnose and goldfish. They are all thriving however, when they spawn in the plants it is a feeding frenzy and in 3 years time we have only had 5 babies. It is so disappointing and not sure if there is anything we can do??? Hi i have a pond with one red comet and 2 koi. The red comet seems to have become really fat the past 3 days it has not come up to eat iether. Could it be laying eggs and if so can those eggs get fertilised by the koi? Hey mike, nice information you have here. I am from singapore. Currently housing 3 ranchu(lionhead) with 2 male and 1 female. Yesterday when i came back after work, noticed my whole tank murky with hundred or thousand of eggs everywhere in my 75gal tank. It almost cover the entire base area. I manage to retrieve some of the eggs from my plants and placed them in a shallow container treated with blue water and air pump for gentle aeration. Now my main tank which was cycled, now having ammonia is reading 0.5, nitrite 0.25, nitrate 5.0 ph 7.6. Will it return back to normal after spawning completed? Will there be possibility that the fry will hatch in the main tank? And how long it might actually takes. Thanks!! Hey mike.. excellent info here… and u respond to all enquiries! I’m from Newstead victoria australia…. ..I think our goldfish r up to shenanigans! And would like some advice on what to put in the water trough ..to help protect the babies to come? Hi, ok it seeems to me that my cois are busy with breeding activities. All signs are showing. Agressive actions, jumping out the water, chasing each other, foam on water and fishy smell. I have no plants, rocks or any structure in my pond. The pond is about 7000 litres. What shoul i do now? Please help me. Very true Mogsie! Goldfish and koi are very fond of eating their own eggs!! Hi, you forgot to add the bit where you dont have any baby fish left as the adults have eaten them all! My sarasa goldfish spawn every year but if i want to keep some i have to remove and rear them in seperate tank. I am in Florida, and I have had 2 of my fish one a beautiful large goldfish and one large yellow koi die back to back for no obvious reason I can account for. They were 6 yrs old and have spawned once this year. I have monitored my water quality since the deaths 2 days ago and this morning I check them and they have spawned. I have never had them spawn in Sept! Is this strange so late in the year and now I wonder if getting ready to spawn had something to do with my 2 fish dying. They had no visible marking on them and looked perfect. Hi I just got my first pond about two months ago. As luck would have it there was a add free koi ,of course I was so excited ,we as in family and I went to get my first koi. The pond was all ready. We got four beautiful big koi. One white, one black, two yellow we could tell one of the yellow one was full of eggs. The white didn’t make it , the black one had jumped out and died. The very next day all the eggs had been layed. What a smell eggs everywhere. We did end up with two babies. My question is can you take out the eggs and put them in aquarium to hatch? I also heard that I should increase the breeding pond water temperature. Everyone tells their own experience, I don’t know which is correct. I had setup a breeding pond, the size is 3.5 x 3 x 3 feet. Hey, sorry to hear that Bill. Hi mike its bill again don’t bother to reply to my last message as I have just found out what is wrong with the goldfish it has got dropsy and it’s far to late to treat it. Hi …I have many very small fry swimming & darting in the pond where I have very large koi. Should I catch the babies from the pond or net the big ones off? How big do fry have to get before they won’t be eaten? My pond is 8X12 about 1 1/2 ft deep. Live in Minnesota where temps drop to-35 or more in winter. I leave the goldfish in the pond, no heater, and the pond freezes over. Come spring they all there swimming around. How can they live? great site and great info. have seperated the eggs from obvious places and placed them in a huge water bottle bottle (5 ltrs). Have put a couple of pieces of oxenagating weed in and a little of the vegetation they were trapped in. Can introduce gentle airation. Is it just wait and see, or do I need to introduce any nourishment. quite happy to grind up some “egg and chips” if that is their fancy but seriously will they progress initially without any extra help from me, and if so, for how long. I have two 8 inch female koi bulging with eggs and one male koi in my san diego pond, the females and male are darting around chasing one another…how many days will this go on before the female releases her eggs and the male fertilizes them to complete the spawning process is??? Is the male koi always ready with sperm? is there an age when the male would not have sperm? thanks so much I can not wait! Hi. Im new to koi and ponds and im loving it i have a 11ft bu 10ft pond 3 and half foot deep. At the deepest point it has 4 shelves or leveles. My kio and gold fish are getting amazing i have 10 gold and 7 koi all get along swimmingly. Its a natural pond with a pump. I have frogs that have moved in too. Some of my fish keep rubbing themselves on the rocks and the base. Do you think they may have eggs?? Thank you reading. Amazing blog by the way. Hello, we had ducks in our pond and bought 10 feeder gold fish to see if the ducks liked them. They didn’t ????. That was last summer. Now we have …. Umh maybe 150 mixed colored gold fish. Not sure what to do now, but I have been feeding the fish since the water temp reached 50 degrees. My husband’s now laughs cause I chase the ducks out of the pond so they don’t eat the fish. How long does the female koi carry the eggs? It has been a couple weeks now, that my female koi has been very fat.At least that is what I am assuming it is. This koi is very fat all of a sudden. Thought the spawning would start by now. I have had babies before, but never really noticed the fat female first. Thank you. April 10th 2017. our 16.000ltr pond with waterfall has six gold fish. today they appeared to be doing the mating rituals, if they have ‘been at it’ what is the gestation period please? We have a small (400+) gallon pond with a waterfall. Almost every year we have one or two new babies, both goldfish and koi. This month, for the first time we saw the koi consistently huddling around a plant near the water surface which is probably the warmest part of the pond. From what I have read in your comments, my guess this has to do with the spawning process. However, we have never seen this congregating since we created the pond almost 10 years ago. Do you have any other words of wisdom? Also, lots of other info, right here in the LOVEYOURPOND blog! Hi I have moved into my new house in November and the previous owner has left the pond full of Koi Carp! I have researched a little and understand not to feed them through the cold months and they have been at the bottom and haven’t needed to worry much! As of today they are all swimming around and coming up to the top of the pond – does this mean I need to start feeding them? Please help any information I’m very grateful as I would love to look after them correctly! Hi Mike, I have 150 gallon Rubbermaid stock tank pond on my patio with 3 mature(apx. 5-6 inches) and 5 young(1-1.5 inch) common goldfish. Earlier in the spring i noticed them showing spawning behavior and quickly made some DIY spawn mops. Unfortunately i missed them that morning and for whatever reason i never saw any fry as a result of that spawn. However, i left the mops in just in case because i had spotted a single egg, and i hoped there could be more. (or more to come) Then this week I saw them frolicking again and i checked the mops which are now LOADED with eggs. I am really excited but also concerned because I’ve read that goldfish are notorious for eating their young. Obviously with only 150 gallons of pond I cant care for them all if they all survived anyways so I’m okay with some losses as long as a few make it. Will some of the fry reach adulthood if everyone is left in the pond together? Or are my adult goldies going to tear it up like hungry orcas? Please advise. I live in Florida and have a small front door pond. I came out to see my small goldfish being pushed around and beat up and looking like she couldn’t breathe. I freaked out and did a 50% water change after noticing it was foaming and murky and oily looking. After the water was out, I noticed these tiny eggs all over. That’s when I researched and found that my goldfish of a year were spawning! I felt like an idiot! ( and probably looked like one too!) Now I am hoping the eggs will hatch with all of my meddling! I live in Orlando, Florida and I think I have some comet goldfish fry in my backyard pond. Generally, I would go outside to see the pond everyday but lately,I had been busy and hadn’t seen it for about 3 days. I came back and the water did smell a bit fishy and I saw little fry looking things. I also saw some black dots on plants that were submerged in the water. Also, I see that the adult comets seem kind of isolated, under the waterfall and not swimming around/being as energetic in a school as they used to. Do you think my comet gold fish may have spawned? After all that, I forgot to ask the question! Food for the fry – I am currently grinding regular fish food (the red and green floaters) to a fine dust and using that, but I have been told that the yellow of a hard boiled egg can be used. Do you have any advice/alternatives? I am a British ex-pat living in the Philippines.. I have a small garden pond, roughly 8 by 5 feet, and this is my first year of keeping koi. Originally I had koi and goldfish (triple-tailed and bubble-eye) but the goldfish were steadily dieing and it wasnt until I was down to the last four (of ten) that I realised that the koi were fin-nipping and stressing out the goldfish! However, that was a side-issue as I was fighting a losing battle against green algae badly colouring the water. I eventually resolved it by having semi-floating pennywort in the two large water-feature bowls and making my own filters out of used fine-nylon fishing net of all things, which works a treat! Being “in the provinces” in the Philippines there is no handy aquatic centre to visit. It could just have easily ended up in the filter and I wouldnt have even known. So, to stop that happening again I managed to net the remaining fry (all six of them) and they are all now safely in the bowl. Sorry if this is a bit long, hopefully other keepers will find this interesting. I have a female comet carrying eggs, I live in the Albany NY area so it is getting cold fast, will she carry eggs through the winter? or will she lose them due to the cold? We got about 8000 litres, sand filter with zeolite & 2 Olive barrels with jap matting, waterfall and aerator. Added extension this past year, and sand filter, which requires plenty maintenance, (I put matting in leaf collector now). We’ve lost a lot of fish in past few years, just up and die on us. Now with extension and better filtration, impeccably clear water, still algae on the sides. Have plants above the watefall for filtration. Haven’t lost a fish in over a year! Now they are near spawning, I think it's gunner be a free for all? Are they likely to all spawn at the same time, the big 'cow' and the young maidens? I thought young koi, like their first year weren't viable as breeders? I can seperate the ponds, and isolate the breeding pairs, if they don't all go off at the same time?? We have petty much smooth sides, rendered, painted concrete with alage, which they chew (salad). Is there any cheap substitutes for laying mats? I know the Koi shop will have some, at a price, but what about Coir mats or similar? So long as they not treated with chemicals… We can then transfer to smaller pond…. PS – I have a comment for Shirley… We live in Helena, MT and we use a floating heater like the ones they use in horse throghs to keep their drinking water from freezing. We put that in the pond when it starts getting cold and they always survive and they hibernate in the pond. You can buy them pretty inexpensive at murdochs. 😉 Want some more koi? What do we do with all the koi babies? It looks like there are about 30. We have about 11 full size koi, and our pond isn’t big enough for over 40 fish when those babies grow up? I have 3 different size babies today the newest batch?? How many times a season do they have babies??? That is what I do to breed my kois, but I only kept the beautiful ones and sale the pet quality to petshop and reseller. I think it is best to breed your koi in a breeding tank so that you have more baby kois to survive parent koi breeders eat their eggs after spawning, so if you breed them in breeding tanks, you can take them after spawning. Hi Mike! I just read your article about spawning Koi and goldfish…really enjoyed it! I noticed ‘babies’ swimming around a few weeks ago and now I’m a very concerned parent! :-) So far all looks good…everyone is getting along, but now I am worried about what to do in the Fall! My pond is under 2 feet at its deepest…only had 4, 5-inch goldfish for about 4 years and so it was easy for me to bring the goldfish in every winter. Now I’ve got these little guys to contend with. Do you think they could be left out for their first winter or do you think I should bring them in as well…separate aquarium? Hi, Mike. Glad to have found this site! I have a small pond (350 gal.) and right now 8 goldfish live in it. I have a fountain and small waterfall for aeration. A few years ago I had a lot of string algae, and when I went to remove it there were some fry in it (very exciting) so I put it back. This year I finally got a UV filter, as have had a lot of green water the past few years and the water really cleared up. I noticed some string algae coming back. I left it alone, hoping for more babies. Notices some to the aggressive spawning behavior a few weeks ago. My question is, should I remove as much of the algae as I can to a tote at this time, hoping it contains eggs? Hello Mike, my pond is 25ftx14ftx32 inches (avg) deep, I have it for at least ten years and there are about 50 goldfish in it, predators get some now and then so the occupant numbers vary. There are six or seven waterlilies and a lotus in pots and at this time cover at least 60 percent of the surface. 6-10 are blooming all the time and with the ones done and sunk and the the leaves deteriorating I go in and take out the leaves and done lilies. I notices spawning behavior but no small fry. My worry is that when removing quite a bit of the lily leaves and stems, am I also removing the eggs which may be attached to them? I clean about once a month. Thanks for all the great information. We installed a 3500 gal pond 4 years ago. My Koi were given to me, I have about 20 and the largest are at least 24″. What is a general rule of thumb for fish to water/ ratio? Our pond is small by comparison to some of your posts. We have had it for almost 20 years. In the winter, we put a small screened puptent over it with heater and bubbler (we live in Maryland and even with some heavy snowfalls, it has always survived.) A few years ago we lost most of our fish to a great blue heron(they are really big and we live close to the Patuxent River, so we now keep netting on the pond year round) We have four goldfish and seven fairly large koi. I think one of the goldfish mated with a koi because it is orange with striated black markings on its head. It is the smallest member of the pond and I try to make sure it gets some pond sticks when I feed them every day, but I think with this exception, our fish are mostly celibate (LOL) because I have never witnessed anything resembling spawning. Is it because the pond is fairly small (a few hundred gallons with a nice equally small waterfall?) I have given some to people with an enormous pond and one small white koi, whom I felt was blind because he always swam around the food, but never seemed to ingest it. He did not survive, sadly. Sorry for the long post, but this is the first time I have ventured on to a site like this. Three years ago I increased my pond size from 135 gls to 750. I have 3 Sarassa goldfish and another 6 Koi. I added another Koi that must be a female because we have had babies the last two years. For the most part the babies are all black with some white or yellow on the heads and perhaps down its back. Since I’m certain that the last Koi added is the Mother, are all of these fish hybrids? Should I assume that they aren’t going to develop the colors that all of the other Koi have? I can’t check for the “whiskers” yet unless I catch one (which isn’t that easy). We do have a beautiful koi that is black and white and we are hoping that they will turn out like that but the more I read the less hopeful I get. Any help you could provide would be appreciated. Hi Mike, thanks so much for all the helpful information! My husband and I recently acquired a number of koi from friend of ours who is selling her house and planning on filling in the koi pond. We ended up with 5 large koi, ranging from about 12″ – 24″ long, and 6 smaller koi about 8″ inches in length. The morning after we introduced these fish into our pond which only had about 15 very small koi in it, we noticed foam all over the top. After reading your article and watching the fish in the pond, it was clear that they were spawning. What I noticed is that there were 3 of the 5 large koi all following and bumping the smallest of the large koi, who I assume is the female. I’m not sure what gender the last and largest koi is as it didn’t seem to be in on any of the action. I’m concerned about having so many male koi with only one female. Is it safe for her, or do we need to remove some of the male koi? Also, I believe our pond is only about 500 gallons. We did not originally intend on keeping all the koi in our pond as we didn’t think it would be big enough for the number and size of all the fish. Should we be looking for a new home for some of our new fishy friends or is there enough room for all of them in our pond? Thanks for your help! Hi Ive got a mixture of koi and goldfish in a large pond approx 2.5mtr x 4mtr x 4..5ft deep, got told that was around 10000ltr??. Over the past couple of weeks I noticed they weren’t really interested in eating and a fishy smell as described above, I thought oh cant wait for new pump and filter to arrive! (After replacing pump and filter on Friday.) Yesterday around my plants and sides of the pond i noticed white foaming, not a large amount. but quite a bit! I studied aquaculture but specialised in shellfish farming. I am right in thinking they have spawned? Mike we have 25 koi we have had our pond for 8 years this year we got lucky noted spawning I removed plants after we have babies… My question is they are one month old and a few of them have some visible black but the rest are completely white or cream it was a flock spawn when will I see color in them or will they stay whitish cream? Mike (Nice article!) if I want to raise some fry in an aquarium I’m guessing they can survive without food for a while, but how long can they last & what should I feed them eventually? I had 8 goldfish in my pond already. The pond is about 12′ X 12′” & 3-4′ deep. I introduced 4 Koi fish today. About 4 of the goldfish were chasing a Koi at any given time & the Koi looked like they were getting cornered & then the goldfish appeared to be nibbling at the Koi. The Koi were getting chased all around the pond & it seemed like they were getting bullied, & harassed by the goldfish. The Koi were having to swim pretty fast & at other times they would try to hid under some of the cave areas, or back up to a rock. My daughter & I took 2 of the largest goldfish out of the pond, leaving 6 smaller ones with the koi. Is this the proper thing to do & what was going on with the fish in our pond? Would they kill the Koi? A really useful post, thanks Mike! I ‘inherited’ a pond with a number of different fish (koi, gold, tench I think) when I purchased a new house earlier in the year. I just went out to feed them this morning, and one of them is being chased quite vehemently and flipping up out of the water quite a bit. We’re going to keep a regular check on her, and if needed move her to a large plastic box (unfortunately I don’t have another pond or tank!) with current pond water if she gets too tired, or would you recommend we just let nature take it’s course? She is probably 18″ and isn’t even the biggest in there! Mike, have had my 300 gal pond for over 10 yrs. See the fish are spawning now. Have also notice they don’t eat much during this time. My biggest fear is when i clean the filters will there be eggs in there? Have an alge pump also which keeps things pretty clear. was wondering why my filter was turned upside down the fish flipped it it is a good size. Something that may help others i have a large black plastic pot sideways from a plant bought. Already has holes in bottom put a rock in it. The fish love it hide there in the winter and also way from prey, think it help with warmth when they are altogether. 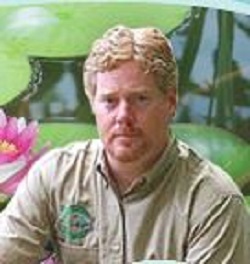 Hi Mike can you please tell me how many times will one Koi spawn ? Does it happen over a number of days or hours etc ? It is just once every year ? My Koi seem to have been spawning for days ?? Hi Mike I have a 40 litre fish tank with 4 lion head gold fish. Have noticed the water becoming very murky there was a bit of aggression over the one fish at one point and now this particular fish continues to lay still on the floor of the tank and every now and then swims quickly to the surface and settles back down on the floor. The other fish are now quite sedate and swim around normally. Is this a sign of spawning? We are on our second batch of fry this season, two different large ponds. I noticed one of our females is expecting and the guys are ready for action. Multi-tier bio filtered ponds n both locations…we managed to save 159 (yes, we counted) fry from first spawn and they are growing nicely in 5 gallon aquarium. It is like having a new baby or a puppy, for sure. This week we found koi that hatched on their own in pond. They are three times as large as our aquarium fry. Question: when do we introduce them to 30 gallon intermediate tank? We will separate tiny ones to remain in 5 gallon until they are large enough to avoid demise from larger fry. Size matters. Last question: once spawn dating commences, when can we expect our female to deliver the goods? We happened to be at the right place, right time, last spawning event. Just let nature take her course and let those who are adept at hiding make their way to adulthood? Hi Mike, My koi did have babies but they vanished, Do they ever eat their young and is there anything I should be doing to protect them? Thanks. My partner called me up at work to tell me we have an intruder all new plants were floating around the pond and the fish seemed to be very agitated all chasing each other around particularly my 2 larger koi was being chased around even to the point where they were leaping out of the water like a dolphin playing by the time I arrived home after my wife put all new plants back where we put them with some extra rocks around them to keep them as marginal rather than bottom of the pond plants and to my surprise the pond is going frothy and skimmer/waterfall filter is starting to smell really fishy I no its not dirty as only done a clean out 2 weeks ago and weather has been overcast with light rain since so no blazing sun to blame could all this relate to spawning. I have a 700 gallon cement pond with a waterfall, right lol and africanized need by the thousands. Can I spray the bees getting water with a soap and water mixture without harming my koi? The koi are spawning now. Hi when we bought the house 6 months ago,one of the reasons is it like koi.i have about 60 full grown koi,5lbs to 10 lbs..is there any possibilities that this koi would lay eggs? Thanks very much, Mike. This answers several questions from the last several years that I did not even think to ask before. I have about 8 goldfish in a fifty gallon stock tank on the deck along with a bunch of Japanese iris which bloom. Only one of the goldfish is from last year because the raccoon got the others. I have a stock tank heater and a filter system which loops the water down a cement pan back into the pond. Everybody has been getting along fine until suddenly one is chasing one other relentlessly. I will wait to see what happens next. Several years ago I did have one fish jump the whole way off the deck to the yard below. Then one other year I had what I now understand were eggs. I will be patient this year and let nature do it nature’s way. Thanks. How do I slow the reproduction of fish in my pond, I just cleared out 150 fish and still have about 60, HELP Do I have to do this every year? I have 2 joining ponds with about 6000 gallon of water between them Last year I threw about that many away also. I started with 3 Koi 10 shubunken and 10 comets. Thank you for this info. Had a pond over 10 years and never seen this activity. I was pretty worried about 1 fish beaching itself in the weed then getting good trapped beaten bitten poked etc by another one and then sandwiched between two fish literally squashing it. I now know it’s a lady fish being attacked by the bad guys. Is it usual for lady fish to be catatonic like state for a while? Good info here… Was doing research as to why one of my goldfish had flipped out of the pond and died. The day before I had cleaned out the coy pond due to the change in water color and smell, about 25% of the water was removed. I have a built in ground coy pond, approx. 300 gals. I didn’t realize that it was mating season. Anyway, because of the smell and water unclarity along with all of the activity with the fish brushing against each other and playing around . I was not aware of what was going on ( mating season). Today, I when to feed my fish and one of them had jumped out and died. This explains what had happened… The aggressive behavior during the mating process explains why one of the goldfish had been playing while mating and had jumped out of the pond (not by choice) For the future, I will lower the water level during the mating season to avoid anymore miss-haps like this. I live in Winnipeg, Manitoba… I have a small backyard pond with 7 koi, I previously brought my koi inside for the winter as are temperatures can be very severe, they are now 5 years old and are very large as well as the rank becomes very smelly, so decided to try to keep them in the pond with a continious pump and pond decider, well I’m exstatic they have all survived. In Winnipeg we also gave the danger of wild animals eg. Raccoons, I have a bridge over the pond that they seem to have been able to out smart the animals so dark. I’m excited to watch for spawning, eggs and babies. Thank you for sharing your information, looking forward to more. how do you know if a koi is full of eggs? Large Koi spawned…should the pond have a small percent of water change?